Thomas Harold “Tom” Tompkins, 85, of Bettendorf, Iowa, passed away on Monday, January 28, 2019 at the Clarissa C. Cook Hospice House, surrounded by his family from cancer complications. Per Tom’s wishes, cremation rites have been administered. A Celebration of Life/Going Away Party will be held from 1:00 p.m. to 4:00 p.m. on Sunday, February 3, 2019 at McGinnis-Chambers Funeral Home in Bettendorf. 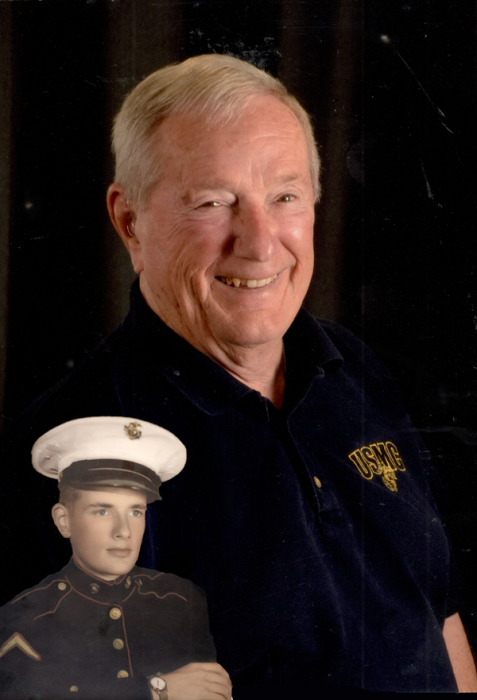 At 4:00 p.m., the Marine Corps League will present a “final salute” for Tom. Please join in this special time to share your memories of Tom, the unique person that he was. Graveside services will be held at 12:00 p.m. on Monday at Rock Island National Cemetery. Those wishing to attend the graveside service should meet at McGinnis-Chambers Funeral Home by 11:30 a.m. Immediately following the graveside service there will be a continuation of his “going away party” at Mickey’s Valley Inn in Pleasant Valley. Please come and share in celebrating the life of a unique individual. Lunch will be included in the celebration. Contributions in memory of Tom may be made to the family to help establish a memorial fund in his memory. Tom was born in Royal Oak, Michigan on July 13, 1933 to Harold G. and Ruth (Borlace) Tompkins. Tom attended school in Clawson, Michigan until he entered the Marine Corps Reserves at age 16. He was called to active duty and served in Korea during 1951-1952. He married Dorothy Sweeney in 1954. He later married Sondra Bergmann in 1991. After serving two years of active duty in the Marine Corps, he relocated from California to Davenport. Tom had many interests: In his day, he was an avid gambler, going on many junkets around the world. He worked for the city of Davenport in the trash collection department, ten years at Oscar Mayer, a year at the Arsenal and had owned and operated two bars, Tom’s Double T and Tom’s Tap. Later he owned and operated the Maquoketa Maid-Rite. He was an “ace” insurance salesman for Rockford Life, earning many awards and trips. He also sold for John Hancock Insurance. He and his wife Sondra trained and became Black Jack dealers when the President Riverboat Casino came to town in 1991. As a charter member of the downtown Davenport YMCA, he would often be found there in a pick-up basketball game or a hot racquetball match and having the “executive” workout. He played softball for years in the Hawkeye and Muny leagues. Tom loved a good time, a good drink and a good joke. Please join the family and recall your memories of a “good” guy. Remember this: Tom hated suits and ties and loved sweats and Crocs. Those left to honor his memory include his wife, Sondra; his sons, Thomas H. Tompkins, Jr. (Gerlinde Richard) of Bettendorf and David John Tompkins (Yvonne) of Davenport; his grandchildren, Sean and Samantha Tompkins, Zachary, Jake and Lexie Tompkins; his great-grandsons, Camdon and Ryker; his sister, Phyllis Jones of Windsor, Canada; his step-children, Dr. Nikole (Jeff) Hicks of Ponca City, Oklahoma and Phillip (Wendy) Anderson of Davenport; and a very special friend, Dorothy Schloemer of Davenport. Tom was preceded in death by his parents; and his sisters, Kay Gomez and Loraine Clifford. Online condolences may be expressed to the family by visiting Tom’s obituary at www.McGinnis-Chambers.com.